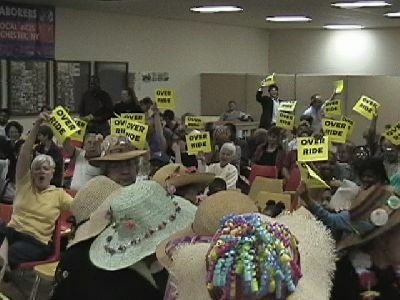 May 1, 2003- Three hundred community members came together Thursday evening at a public forum to demand a fair budget. The event was held at Laborers' 435 Hall in Rochester. The Families First Coalition sponsored the event, led by the Working Families Party, NYSUT (New York State Union of Teachers), Metro Justice, and Action for a Better Community. The Families First Coalition presented three proposals at the Rally that have not been discussed in the recent budget talks in Albany and go a long way towards redefining the debate. State senators Robach and Alesi both sent aides to the forum to read prepared statements. Each aid was asked whether the state senators would endorse the proposals. While the State Legislature has passed an amended budget restoring some of the funding Gov. Pataki's proposal would have cut, Pataki has threatened to veto the new budget. The call of the rally was to demand that the state legislature override this veto if it comes to that. The three proposals that were presented include a stock sales tax, the closing of corporate tax loopholes, and a progressive income tax. Talking on closing corporate tax loopholes, Nick Fici of the Finger Lakes Working Families Party said “There has been a 50 percent decline in corporate taxes since 1977. He pointed out that this decline in taxes on corporations has not lead to more jobs, which is often the justification for such tax cuts.